The recently announced Trump tax plan (US Treasury 2017) proposes to cut the corporate tax rate from 35% to 20%, and to shift the tax base from a worldwide to a territorial system. The new statutory rate of 20% brings the US corporate tax in line with the average rate of 22% for the other OECD member countries. With this move, the US joins the steady decline of statutory corporate tax rates around the world (Auerbach 2017). Similarly, with the move to a territorial system, the US aligns itself with other OECD countries that exempt foreign source income (generally, if taxed in the source country). Note that other large economies, such as the UK and Japan, have also made this move in recent years. As is well known, under the current US worldwide system, taxes on foreign earnings are due only upon actual repatriation to the US. Therefore, firms have an incentive to keep these earnings ‘off-shore’, that is, outside the US. This ‘lock-out’ effect does not occur under a territorial system. Overseas unrepatriated earnings of US multinationals are estimated at some $3 trillion. The Trump tax plan proposes to deem these earnings as repatriated and hence taxable in the US, with a higher rate on earnings held in cash and a lower rate on illiquid assets (the rates have not yet been specified). It should be noted that abandoning worldwide taxation makes profit-shifting to tax havens even more attractive for US multinationals because it makes tax avoidance final. The worldwide system provides a backstop to base erosion since the shifted profits should eventually be repatriated and taxed (Marples and Gravelle 2017). The Trump plan suggests that rules to prevent profit-shifting will follow. Another important change of the corporate tax base is the proposed immediate write-off of the cost of new investments for a period of at least five years – a move in the direction of a cash flow tax. This element of the tax plan finds support in the destination based cash-flow tax proposed by the Speaker of the House of Representatives, Paul Ryan,1 and it is also advocated by Auerbach et al. (2017). A fundamental characteristic of business cash-flow taxation is that it exempts the normal or hurdle rate of return on capital. By contrast, a large number of European countries (Cnossen 2017) are moving toward comprehensive business income taxation (CBIT) (US Treasury 1992) which involves base broadening by denying a deduction for interest at the business level and exempting it at the level of the recipient. Further, the rate-cutting/base narrowing of the Trump tax plan should inflate the budget deficit. We leave these aspects for another column and confine our comments to the consequences for tax inversions. Tax inversion involves a restructuring of a multinational organisation in which its legal residence – a criterion for defining the taxing jurisdiction – is shifted abroad without a corresponding shift in economic activity. Early examples are inversions to tax havens, such as Bermuda and the Cayman Islands. A recent example is the merger of Tim Hortons and Burger King, which moved the latter’s headquarters to Canada. This merger is noteworthy because it circumvented a provision in the American Jobs Creation Act of 2004 (AJCA), which was meant to discourage inversions. ACJA stipulated that the tax benefits of inversion would be denied if the original US shareholders owned 80% or more of the post-inversion company. This provision was avoided by bringing a foreign company on board, which brought the non-US ownership up to 20% or higher. Mergers did the trick and after an initial decline the number of inversions went up again (Neely and Sherrer 2017). In a Vox column written by two of us January 2015, we predicted a continuation of the arms race between the US Treasury and multinationals (Van ’t Riet and A Lejour 2015). Time after time, new legal obstacles that the Treasury put into place left the main rationale for inversions – enormous tax benefits – largely untouched. Although the Burger King relocation was not halted, new rules did stop the Pfizer-Allergan deal (US Pharma giant Pfizer had announced a $160 billion merger with Ireland-based Allergan, involving a move of its headquarters to Dublin). We demonstrate the underlying tax motives for inversion with dividend repatriation tax rates (Van ‘t Riet and Lejour 2017). For a set of 108 jurisdictions, including tax havens, we consider all pairwise combinations of host (source) and home (residence) countries and construct bilateral tax rates which are the double taxation on top of the corporate income tax of the host country. These double taxes are incurred upon repatriation of the dividends and typically consist of the non-resident withholding taxes levied by the host country. Next, the repatriation tax may include home country taxation of the foreign-source dividend income, depending on its double tax relief system. Usually, countries will have signed bilateral double tax treaties, reciprocally agreeing on reduced withholding tax rates. Given the bilateral rates, GDP-weighted average repatriation tax rates can be computed for inbound dividends on a country-by-country basis. Low average rates for inbound dividends make a country attractive for situating its multinational headquarters. 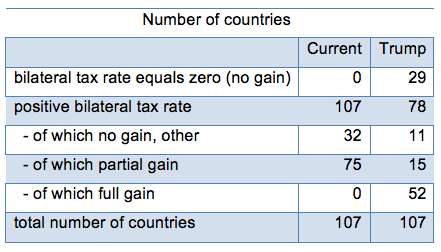 For a number of selected countries, Table 1 presents tax parameters and the average dividend repatriation tax rates. Notes: * credit system but exemption for treaty partners, # corporate income tax inclusive of local (state) taxes; for the US 4.1% on average. Source: Van ‘t Riet and Lejour (2017) and new calculations. The Netherlands heads the list with a low average rate of 3.4%. It applies exemption as double tax relief and has a large number of bilateral tax treaties (74) within the set of 108 countries with which it has negotiated reduced withholding tax rates. Several times, the Netherlands has been host to inversions; a recent example is the 2015 Mylan-Abott deal. Finland is second on the list, which may be surprising since it applies a credit system; however, dividend repatriation from treaty partners is exempt. The same holds for Canada. Ireland, ranked 11th on the list, does have a worldwide tax system, but in practice its low corporate income tax rate of 12.5% implies a territorial system because with taxes paid abroad, nothing will be payable in Ireland. The tax benefits for US multinationals of relocating their headquarters are obvious when considering the US average repatriation tax rate of 16.7%. A move to Canada or a European country makes a difference, on average, of at least 10 percentage points of the tax on repatriated dividends. Under the Trump tax plan, the bilateral rates and the average repatriation tax rate for inbound dividends to the US become 6.6% instead of 16.7%. The substantial difference with the other OECD countries has vanished and inversions are no longer lucrative. We observe that the base narrowing and tax rate shift each would remove, or strongly reduce, the tax rationale for inversion. Burger King, Mylan, and other inverted US multinationals can return home! The tax rates presented above are averages for 107 countries. At the country level, however, the system shift and the tax rate cut offer new opportunities for tax avoidance. In the current system, repatriation taxes are paid on top of the corporate income tax in the foreign country. These are the dividend withholding tax paid on outgoing dividends in the foreign country and the tax in the US, subject to the tax credit. Upon introduction of the territorial system, the US tax will be eliminated. At that point, the incoming dividends from 29 countries will not be taxed at all, because these countries do not have a withholding tax on dividends repatriated to the US; the bilateral tax rate is zero. 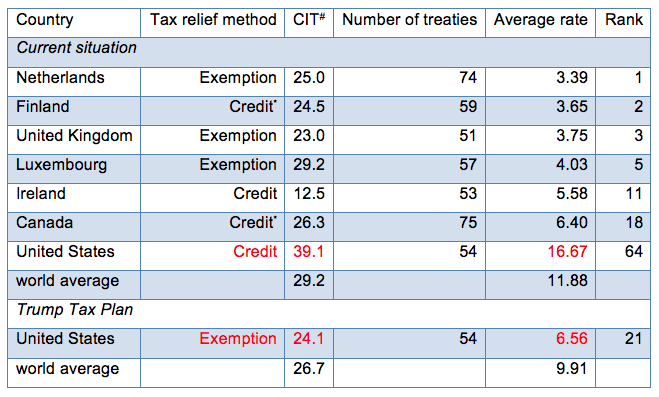 The other 78 countries do levy a tax on dividend repatriations to the US, but in most cases this tax can be reduced by redirecting the dividends through third countries, which have more generous tax treaties – a practice called treaty shopping. For dividends from 52 countries, the bilateral tax can even be lowered to 0%, which is not possible under the current system (see Table 2). Moreover, the average gain (tax reduction) possible via treaty shopping will also be higher. Thus, although the Trump tax plan will stop inversions and eliminate the lock-out problem, it may stimulate new tax avoidance in the form of treaty shopping. Auerbach, A (2017), “Understanding the destination-based approach to business taxation”, VoxEU.org, 26 October. Auerbach, A, M P Devereux, M Keen and J Vella (2017), “Destination-based cash flow taxation”, Oxford University Centre for Business Taxation, WP17/01. Cnossen, S (2017), “Corporation taxes in the European Union: Slowly moving toward comprehensive business income taxation?”, International Tax and Public Finance, online 1 August. Knowles, D (2015), “Donald Trump: Don’t blame Pfizer for Corporate Inversion Problem”, Bloomberg, 2 November. Marples, D J and J G Gravelle (2017), “Corporate expatriation, inversions, and mergers: Tax issues”, Congressional Research Service Report. Neely M C and L D Sherrer (2017), A look at corporate inversions, inside and out, Federal Reverse Bank of St. Louis. US Treasury (2017), “Tax reform: Unified framework for fixing our broken tax code”, 27 September. Van ’t Riet, M and A Lejour (2015), “Tax inversion remains (huge)”, VoxEU.org, 5 January. Van ’t Riet, M and A Lejour (2017), “Optimal tax routing: Network analysis of FDI diversion”, CPB Discussion Paper 349.